Background: Correction of a crooked or deviated nose is a major challenge for rhinoplasty surgeons. In the present study we proposed to compare the aesthetic and functional results of unilateral grafting using spreader grafts on the convex side of the nasal deviation with those used on the concave side. Methods: In this study, the technique and aesthetic and functional outcomes of the correction of crooked noses with spreader graft placement at either convex or concave side of the nasal deviation are presented. Results: Unilateral spreader graft was used in 66 patients with C-type deviated nose. At the discretion of the rhinoplasty surgeon, the spreader graft was placed in the convex side of the nasal deviation in 33 patients (group A) and in the concave side of the nasal deviation in the remaining 33 patients (group B). During an average following-up period of 18 months (ranged from 8 to 36 months), there were no complications, infection, or graft extrusions. Functional evaluation was performed using a visual analog scale before and 4 months after surgery. Patients were asked to score their nasal breathing on a scale from 0 to 10. In group A (convex group), the mean preoperative score was 6.32+/-1.02 (ranging from 2 to 8), and the mean postoperative score was 2.03+/-1.01 (ranging from 0 to 4). In group B (concave group), the mean preoperative score was 6.76+/-1.10 (ranging from 2 to 8), and the mean postoperative score was 3.67+/-1.80 (ranging from 2 to 7). Patients with spreader graft at the convex side showed higher increase in angle measurements as compared to the patients with spreader graft in the concave side. Moreover, patients with spreader graft at the convex side were more likely to have excellent or good surgical outcomes (according to the degree of correction in the angle of deviation) as compared to patients with spreader graft in the concave side. Conclusion: The use of the spreader graft is a safe and effective method for correction of crooked noses. We showed that speeder graft at the convex side of C-type nose deformity provided better aesthetic and functional results as compared to the placement of the speeder graft in the concave side of the nasal deformity. Correction of the crooked or deviated nose presents one of the most cosmetic and functional challenging surgeries in rhinoplasty 1,2,3,4. It can pose particular difficulties to the surgeon because it is often associated with several other anatomical deformations such as nasal septum cartilage alterations, misalignment of the septal cartilage on the maxillary bone, nasal tip rotation, nasal bone asymmetry and deformities 1. More importantly, patients with deviated nose harbor various degrees of airflow obstruction and difficult breathing due to a deviated septum and external nasal anatomy. Deviated noses are often caused by previous nasal trauma 5. However, some patients have congenital deviated nose and through the process of growth and puberty, the nose grows more deviated. From the point of external shape, deviated nose are classified as C-type, S-type and L-type. In a C-shaped deviated nose, one side of the nasal dorsum is concave, and the other side is convex. Depending on the portion of the nose that is deviated, surgical treatment to re-build the nose back to a more midline position could be carried out through anatomical reconstructive efforts 2, while the main corrective methods for C-shaped noses include the implantation of lateral cartilage grafts such as spreader grafts. Spreader grafts are strut-shaped cartilage grafts, which are placed between the anterior septal edge and the upper lateral cartilages. These might be used either at one side (unilateral) or both sides (bilaterally). Spreader grafts are usually harvested from autologous cartilage (such as nasal septum, auricle and ribs) 6,7. However, they could also be made from synthetic materials such as hyaluronic acid (Restylane) 8, calcium hydroxylapatite (Radiesse) 9, high-density porous polyethylene (Medpor) 10,11, and polymer of polylactic and polyglycolic acid (Lactosorb) 12. Depending on the corrected deformity, spreader grafts are able to straighten the anterior edge of the septum, caudal septum and cartilaginous dorsum, prevent the collapse of the middle vault and the stenosis of the inner nasal valve, correct the asymmetries in the cartilaginous dorsum, and make a connection between septum and columella. Hence, spreader grafts play an important role to achieve satisfactory long-term results in a wide range of nasal deformities, especially among those with a deviated nose. Although a great body of research has evaluated the results of spreader graft implantation in patients with deviated noses, sufficient data are lacking to guide surgeons to choose the most appropriate side of the nasal septum (concave vs. convex side) for spreader graft implantation to achieve the highest aesthetic and functional outcomes. As a result, in the present study we aimed to compare both aesthetic and functional priority of unilateral grafting using spreader grafts on the convex and the concave sides of the nasal deviation. From March 2015 through May 2017, a total of 66 patients with ‘’C-type’’ nose deviation, who underwent open septorhinoplasty at 15-e-Khordad hospital, Tehran, Iran, were included in the study. The type of septal deviation was confirmed based on CT scan and physical examination. All the patients had both functional and cosmetic nasal deformities. An informed written consent and any accompanying images were obtained from all patients for the publication of this research. The study was approved by the Institutional Review Board at Shaheed Beheshti University of Medical Sciences (Tehran, Iran). After patients’ history was obtained and physical examinations were completed, the patients were photographed from frontal, lateral and caudal-cranial views using digital cameras. Thereafter, open rhinoplasty procedure was adopted in all patients by the senior author. All cases required spreader grafts for correction of the nasal deviation. Spreader graft was placed in the convex side of the nasal deviation in 33 patients and in the concave side in the remaining 33 cases, at the discretion of the surgeon. There were 36 female patients and 20 male patients. Of these, 20 patients had a history of trauma prior to nasal deviation. The mean age was 27 years (ranged from 17 to 39 years). All patients underwent open rhinoplasty procedure in supine position and under general anesthesia with assisted ventilation. An incision was made at the narrowest part of the columella, which is generally near its midportion. The incision was continued intranasally through an infra-cartilaginous incision. Through this incision, we exposed the alar cartilages. We dissected below the perichondrium and periosteum, exposing the nasal dorsum together with the cartilaginous septum and its lateral projection. With a sharp cottle elevator, the mucoperichondrium was elevated off the right side, and then the left side of the septum and maxillary crest, but the caudal or dorsal septum were not elevated. With the use of a No.15 blade that started at the perpendicular plate, the septal cartilage was incised 10 mm below and parallelly to the dorsal septal edge, and down within 10 mm of the caudal septum. At the caudal edge of the incision, an incision was made in parallel to the caudal septum, leaving 10-mm caudal strut down to the maxillary crest area. At this stage, the septum was carefully inspected to determine the exact cause of the septal deviation. The crooked dorsal septal cartilage was crosshatched vigorously to break any deformities, such as fractures or concavities. Just before it was to be reconstructed, it was weakened, leaving a framework to guide placement of the spreader graft. After septum repositioning, we placed the spreader graft taken from the septoplasty between the septal cartilage and its lateral projection into the convex deviation side in half of the patients and into the concave deviation side in the others. The grafts were 2.5 cm-5 mm in size and were 0.8 mm thick. The grafts were passed under the nasal bones to the anterior septal angle. The dorsal edge of the spreader graft ran immediately under the dorsal cartilage and did not protrude above it. After that, we used a u-shaped suture to join the septum lateral projections to the spreader graft and the remaining nasal septum. For patients who had symptomatic obstructive hypertrophic inferior turbinates, a turbinoplasty was performed. An endonasal osteotomy was performed to narrow a wide bony vault and close an open roof defect, or to straighten deviated nasal bones. Skin and mucosa were sutured, and the nasal cavity was packed. All patients were followed up for a mean duration of 18 months (ranged from 8 to 36 months). During this period, clinical examination, photographic documentation, and functional analysis were performed. Functional assessment of surgical outcome was carried out using a visual analog scale before- and 4 months after the surgery, in which patients were asked to score their nasal obstruction on a scale ranging from 0 (no obstruction) to 10 (complete obstruction). Moreover, objective assessment of aesthetic improvement was provided by evaluation of the photographs of nose before- and 4 months after surgery by 3 independent surgeons. Based on the consensus between these surgeons, regarding the percentage of improvement in angular values of nasal deviation, the success rate of rhinoplasty procedure was classified as excellent, good, acceptable or unsuccessful as described in Table 1. The ideal angular value of C-shaped noses was 180o (*). Deviation angles were measured using photographs of frontal (anterior) views, provided that the Frankfork horizontal line was parallel to the ground. The deviation angles of the C-type crooked nose were measured as follows: first, the vertical midline plane from the glabella (A) to the middle point of the upper lip (D) was determined, then the nasion (B) and nasal tip (C) were marked on this vertical midline plane of the face, later, the most prominent point of the convexity (E) was determined. The angle between the BE and EC lines was defined as the C-type nose deviation angle. The mean age in group A was 23.9 years (17-32 years) and in group B was 24.2 years (18-35 years). Throughout the average follow-up period of 18 months, no airway obstruction, graft extrusion, or infection occurred. None of the cases needed revision rhinoplasty. Patients were asked to score their nasal breathing on a scale ranging from 0 to 10. In group A (convex group), the mean preoperative score was 6.32±1.02 (ranged 2-8), and the mean postoperative score was 2.03±1.01 (ranged 0-4). In group B (concave group), the mean preoperative score was 6.76±1.10 (ranged 2-8), and the mean postoperative score was 3.67±1.80 (ranged 2-7). Table 2 shows the preoperative and postoperative angle measurements for patients with deviated nose. The outcomes of convex spreader graft (group A) were closer to the ideal angle (180o) than those for the concave spreader graft (group B). Moreover, the results showed that 46% of patients in group A had excellent results and 29% had good results, while in group B only 14% of patients had excellent results and 36% had good results (Table 3). However, no significant differences were observed between the 2 groups with respect to breathing function. The major goal of the modern rhinoplasty is to create a nose that meets the aesthetic purposes of the patients, balances with their face and ethnicity, and resolves their respiratory problems. The deviated nose presents a particular challenge to surgeons because patients frequently have both functional (airway obstruction) and aesthetic problems, which must be addressed together. The most appropriate approach to the deviated nose relies on adopting surgical techniques, which simultaneously restore aesthetic parameters and help to maintain airway patency. Several techniques have been used in for this purpose. Currently, adoption of cartilage grafts, known as spreader grafts, provides the most favorable results in the patients with deviated or crooked nose undergoing rhinoplasty and revision procedure. Spreader grafting, or placement of spreader grafts, is a complex surgical maneuver commonly used in rhinoplasty. This technique was first introduced by Jack Sheen in the mid-1980s, who proposed using spreader grafts to reconstruct the middle portion of the nasal bridge. Since then, the indications for implantation of spreader grafts in rhinoplasty have been considerably expanded. Spreader grafts are made by carving out a rectangular segment of cartilage. This cartilage could be harvested from a variety of sources including nasal septum, auricle, and ribs 7. In patients with intact nasal septum, it is usually the first choice to create a spreader graft. However, some patients, especially those undergoing revision rhinoplasty nasal septum, may not provide sufficient cartilage. Auricular cartilage is a reasonable alternative in such cases. Costal cartilages are less often harvested due to the potential risk of pneumothorax. Spreader grafts can be placed either endonasally or by external rhinoplasty approaches. Jang and Sinha (2007) reported their results of septorhinoplasty using spreader graft in 33 Korean patients with nasal deviation. They successfully used bilateral spreader graft in 30 of their patients. They used the unilateral spreader graft only in 1 case to overcome the concave deformity. Two cases required two slices of spreader graft on one side 8. Moreover, Oliveira et al. could successfully facilitate reconstruction by inserting the spreader graft in the convex side of six patients with deviated nose 9. Giacomini et al. (2010) could successfully facilitate adjustment of the distal septum intraoperatively by placement of modified spreader graft interlocked on the convex side on 15 patients 10. Furthermore, Sadooghi et al. (2012) used an extended osteocartilaginous spreader graft in the concave side of nose deviation in 59 patients 11. They showed excellent results in 48 patients (81.3%), fair improvement in 8 patients (13.6%) and poor results in 3 patients (5.1%). The middle vault of the nose is referred to the middle one-third of the nasal bridge, i.e. nose above the nasal tip cartilages and below the nasal bones. The middle vault is comprised of a paired upper lateral cartilage on each side and a portion of the septum spaced between these two cartilages (known as the dorsal septum). Since in most patients, the middle vault constitutes the entire 1/3 of the nasal bridge as seen from the frontal view, it plays a vital role in the aesthetic appearance of the nose. Any abnormal contour involving the middle vault of the nose can easily disrupt cosmetic appearance of the nose from the front view, such as that occurs in C-type nose deviation. In terms of cosmetic appearance, the spreader grafts help to straighten the middle nasal vault. The placement of the graft in the convex side of nose deviation pushes the opposite side of the nose outward. Moreover, implantation of the spreader graft also provides extra width for aesthetic purposes 13. Hence, in many cases with nose deviations due to depressed or collapsed upper lateral cartilage, or narrowed middle vault, placement of a spreader graft helps to restore a more pleasing aesthetic result. Our results showed that patients with spreader graft at the convex side have conspicuously increased angle measurements as compared to the patients with spreader graft in the concave side. Moreover, our study demonstrated that patients with spreader graft at the convex side were more likely to be in the category of excellent or good surgical success, according to the degree of correction in the angle, as compared to the placement of the graft on the concave side. Results of the current investigation revealed that placement of the spreader graft in each side of the nose deviation could improve the cosmetic appearance of the deviation, reflected by the increase in the angle measurements, and spreader graft using in the convex side yields a significantly higher correction of the C-type deviation. Our results demonstrated that spreader graft in either convex side or concave side of the nasal deviation provides positive effects on the airway obstructive symptoms of patients with crooked noses. 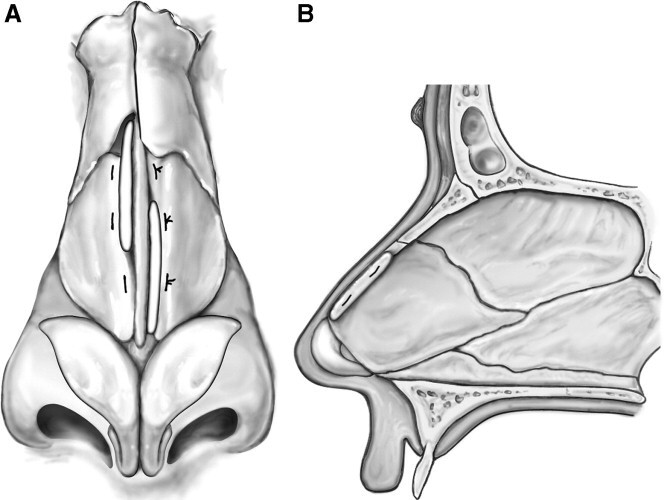 Spreader graft has been previously shown to improve breathing function in all patients with primary complaints of nasal obstruction due to anatomical deformations and this procedure opens the internal nasal valve area. To explain in more detail, on each side of the nose, the junction of the upper lateral cartilage and dorsal septum creates an angle known as internal nasal valve, which is normally approximately 10-15 degrees in Caucasian noses. This angulation varies between different ethnic groups. The internal nasal valve is important in nasal breathing as this endonasal area has the highest resistance to airflow compared with any other region. Consequently, in patients with the less ideal angle that is inherently weak or more floppy than normal upper lateral cartilages, resistance to airflow markedly increases, which leads to a higher degree of nasal obstruction. This condition could also be seen in patients with prior rhinoplasty with compromised middle vault anatomy. The implantation of spreader grafts prevents collapse of the upper lateral cartilage and difficult nose breathing. Our results suggest that spreader grafts significantly benefit patients with deviated nose and improve breathing outcomes of the procedure. De Pochat et al. showed that symmetrical placement of spreader grafts along the dorsal edge of the septal cartilage and open rhinoplasty approach effectively reconstruct the internal nasal valve and improves nasal patency 13. In conclusion, the main finding of the present study was that spreader grafts at the convex side of the C-typed nose deformity provides better aesthetic and functional results as compared to the placement of the spreader graft into the concave side of the nasal deformity. Rohrich R.J., Gunter J.P., Deuber M.A., Adams W.P., The deviated nose: optimizing results using a simplied classification and algorithmic approach. Plast Reconstr Surg. 2002; 110 : 6 . Dingman R.O., Natvig P., The deviated nose. Clin Plast Surg. 1977; 4 : 145-152 . Ramirez O.M., Pozner N.J., Treatment by separation of its components and internal cartilage spling. Clin plast surg. 1996; 392 : 327-32 . Stucker F.J., Management of the scoliotic nose. Laryngoscope. 1982; 92 (2) : 128-34 . Parrilla C., Artuso A., Gallus R., Galli J., Paludetti G., The role of septal surgery in cosmetic rhinoplasty. Acta Otorhinolaryngol Ital. 2013; 33 (3) : 146-53 . Byrd H.S., Salomon J., Flood J., Correction of the crooked nose. Plast Reconstr Surg. 1998; 102 (6) : 2148-57 . Seyhan A., Ozden S., Gungor M., Celik D., A double-layered, stepped spreader graft for the deviated nose. Ann Plast Surg. 2009; 62 (6) : 604-8 . Jang Y.J., Sinha V., Spreader graft in septo-rhinoplasty. Indian J Otolaryngol Head Neck Surg. 2007; 59 (2) : 100-2 . Oliveira P.W., Pezato R., Gregório L.C., Deviated nose correction by using the spreader graft in the convex side. Rev Bras Otorrinolaringol (Engl Ed). 2006; 72 (6) : 760-3 . Giacomini P., Lanciani R., Di Girolamo S., Ferraro S., Ottaviani F., Caudal septal deviation correction by interlocked graft technique. Ann Plast Surg. 2010; 65 (3) : 280-4 . Sadooghi M., Ghazizadeh M., Extended osteocartilaginous spreader graft for reconstruction of deviated nose. Otolaryngol Head Neck Surg. 2012; 146 (5) : 712-5 . Ozturan O., Mimah M.C., Yigit B., Cokkeser V.Y., Kizilay A., Akta S.T., Approaches to twisted nose and result of treatment. Kulak Burun bogaz lh Tis Derg. 2002; (91) : 21-29 .
de Pochat V.D., Alonso N., Mendes R.R., Cunha M.S., Menezes J.V., Nasal patency after open rhinoplasty with spreader grafts. J Plast Reconstr Aesthet Surg. 2012; 65 (6) : 732-8 . Seyed Mehdi Moosavizadeh, Hormoz Mahmoudvand, Sedigheh Nadri, Abdolreza Rouientan, 2019.